plastic surgery of a canthus. /can·tho·plas·ty/ (kan´thah-plas″te) plastic surgery of a canthus. 1. 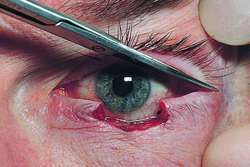 The lengthening of the palpebral fissure of the eyelids by cutting through the external canthus. 2. Surgical restoration of the canthus. a form of plastic surgery used to lengthen the palpebral fissure through the lateral canthus or to restore a defective canthus (the junction of eyelids).